As one of the names synonymous with quality vodka, Grey Goose is a brand that others are often compared to. This is for an obvious reason: it's good. This premium vodka has an expansive portfolio of delicately flavored vodkas reminiscent of its original, benchmark-setting clear vodka. Each of the individual bottlings lends a sophisticated, smooth taste, indicative of Grey Goose's tagline claiming it to be the "World's Best Tasting Vodka." Is it really the best? That is a matter of opinion, yet if you're looking for a quality vodka that is reliable and at a decent price, then Grey Goose is an excellent option. It's a nice one to keep in your bar to create clean, smooth vodka cocktails. As with any flavored vodka, the base liquor establishes and either makes or breaks the entire portfolio. In this case, Grey Goose's clear vodka is the refined beginning expected from the epicurean traditions of France. Every aspect that leads to the resulting soft, crisp vodka is as refined as the finished libation itself. The vodka begins with a selection of French wheat grown in the Beauce region and spring water naturally filtered through champagne limestone. In its entirety, the carefully calculated five-step distillation process leads to the delicately smooth, clean flavor of Grey Goose. There is no doubt of the diligence and expertise of the vodka artisans who create it. While you can enjoy Grey Goose in any vodka cocktail you choose, the brand does a nice job of creating new recipes for their vodkas. The Honey Deuce, a delicious vodka lemonade with Chambord and melon balls that is fun for summer. In the colder months, the Peppermint Froth is a tasty treat of peppermint and cream. We have seen many changes over the years in the vodka market and one of the biggest has been the rise of flavored vodkas. Unlike some vodka brands, Grey Goose's portfolio has always remained small, offering just a few options at a time. The portfolio has changed from time to time. New flavors like Cherry Noir and Le Melon are among the latest additions. At the same time, the favorite La Vanille seems to have been discontinued. This is a disappointment because that was one of the best vanilla vodkas available. Yet, all things change and we can only expect more to come in the future. What is nice about Grey Goose's flavor strategy is that it has not yet reached an outlandish point. There are no whipped cream vodkas or other wacky flavors that seem to be more gimmick than anything else. No, all of Grey Goose's flavors are practical and useful in real world cocktails that any drinker can appreciate. As one would expect from a name with the prestige and notoriety of Grey Goose, only the finest flavor sources at their peaks are used. Each of the familiar bottles, with their elegant design, is adorned with an impressionist painting of the flavor inside. This peaks through the frosted glass via a goose silhouette. Through all of these changes, two constants have remained in the Grey Goose line-up. The brand offers two options for citrus vodka: Le Citron and L'Orange. Both are spectacular and can find a home in popular cocktails like the Cosmopolitan and Kiwi Martini or any recipe that calls for a citrus vodka like the brand's Muddled Rebuttal. Le Citron. A colorful representation of the zest of lemons can be found inside Grey Goose Le Citron. The nose is filled with fresh, sweet lemons and waves of lavender and rose. As a lemon-flavored vodka goes, Le Citron displays a beauty few others have attained. It has a warm, sweet zestiness, hints of brightness touched by rose, and an elegant twang of raw lemon to finish the experience off wonderfully. L'Orange. Bright, crisp, clear and zesty come to mind when tasting Grey Goose L'Orange. The delicate balance of sweet oranges displayed in a bright herbal bouquet tease the senses prior to any liquid touching the tongue. The natural, fresh taste that seductively introduces itself is the ideal of orange perfection, best thought of in a warm afternoon light. Infused with the natural essences of ripe Buerre d' Anjou (Anjou Pears of France), Grey goose La Poire is a fine balance of sweetness and enduring flavor. The introduction of honeysuckle and a bountiful floral bouquet is a beautiful lead into the prized, soft and inviting pear flavor and crisp, long finish. Pear is an emerging vodka flavor and it has quickly gained notice. Grey Goose's offering just happens to be one of the best and it is fantastic in any pear vodka cocktail you want to mix it in. When it was first released in 2007, La Poire was featured in a fascinating array of original drinks. Among those are the Ginger Snap Martini, with its rich flavors and spice, and the Tuscan Pear, which takes a softer approach to the pear-ginger combination. For a slightly brighter use of this pear vodka, the Lotus Blossom is a treat and pairs the fruit with sake and lychee. The Sparkling Shamrock also has a spring-like feel and features cucumber, elderflower, and lemonade. 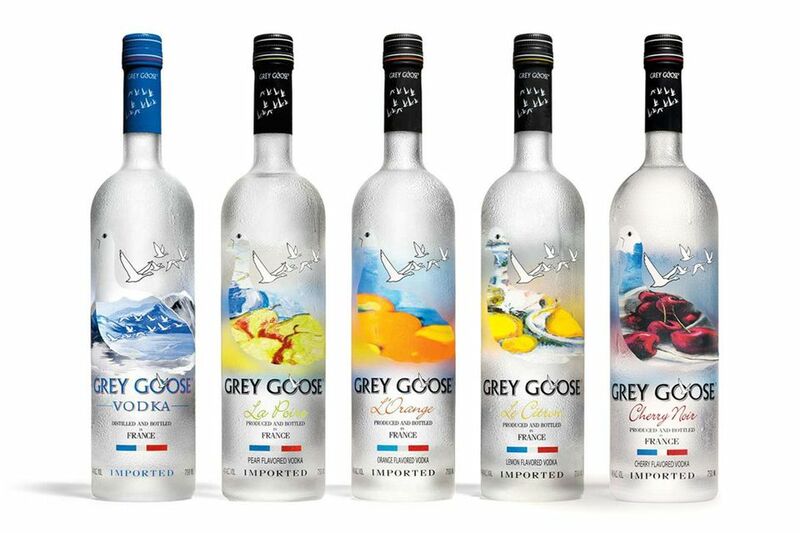 The latest additions to the Grey Goose portfolio are the melon and cherry flavors. These are equally impressive and just as useful in the bar. Le Melon can find a home in any summer vodka cocktail you wish to make. It has a sweeter taste than you might expect and is flavored with the French Cavaillon melon, which is known for its high sugar content. Cherry Noir is the most welcomed addition to the Grey Goose family. Prior to this, cherry vodka was disappointing as the fruit flavor becomes very medicinal when mixed with grain alcohol. As the French name indicates, this vodka is made with black cherries, and there lies the biggest difference. Finally, a great cherry vodka is available, and it can make a fantastic Cherry Lane cocktail. All of Grey Goose's vodkas are distilled from select French wheat and flavored with natural ingredients. Most resources are sourced from France. Grey Goose bottles each vodka at 40 percent alcohol by volume (80 proof). This is different than most flavored vodkas, which tend to be 70 proof. You will find that Grey Goose is reasonably priced and any 750ml bottle should be in the $30 range.